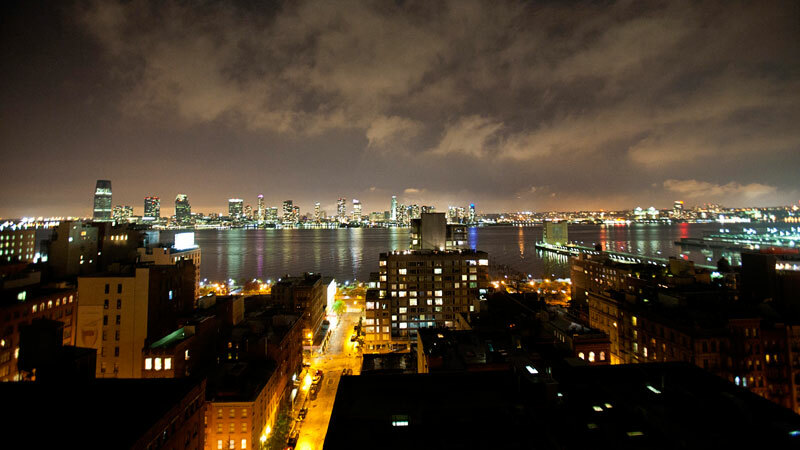 ACI America hosted its Inaugural Cocktail Party on Tuesday Sept. 30th 2014 at Tribeca Rooftop, located at 2 Desbrosses Street (Between Hudson & Greenwich Streets), New York, NY 10013 between 6:00pm-9:00pm. The Global ACI Executive Council was in attendance to share their views and discuss their efforts on all relevant matters impacting the FX industry. ACI America was also proud to announce that Mr. Carl Weinberg, Chief Economist and Managing Director of High Frequency Economics, Ltd. was their guest speaker. Mr. Weinberg offered his views on Market structure, regulation, and FX valuation. He also took questions from the audience. On behalf of Mr. Eddie Tan, chairman of ACI governing council, Mr. Marshall Bailey, President of ACI international, all global ACI committee chairs, presidents of ACI country charters, and the ACI America Executive committee, it gives me great pleasure to welcome you to our inaugural event here in the USA. My name is Vincent Sangiovanni. 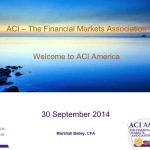 It is my honor to serve as President of ACI America. September 30th 2014 represents a day that was marked on the calendar of the executive committee for the past 11 months. We have worked hard with our international colleagues to build a regional charter that finally represents the rich history of ACI. 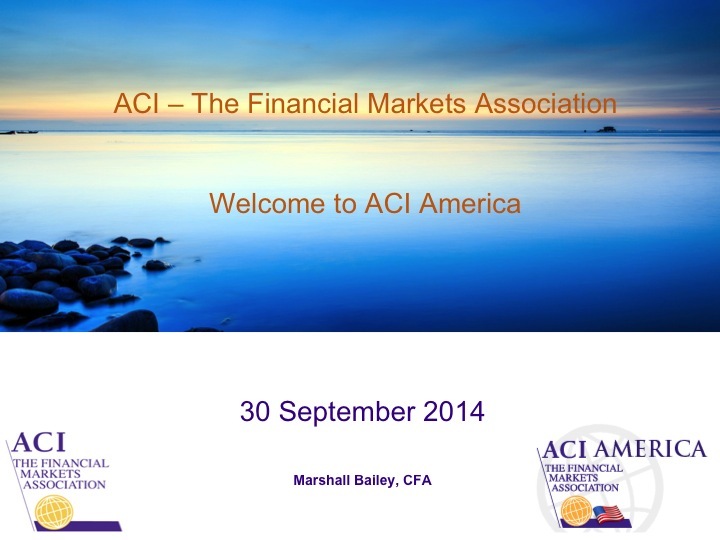 With over 15,000 members in over 65 countries, ACI the financial markets association has and will always be an association built by professional traders for professional traders. There is no other collective organization like it anywhere in the world. 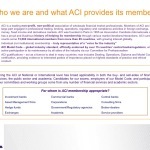 The global leadership of ACI has deep knowledge of all market competencies. 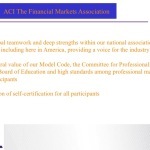 Within the core of this great association reside 3 very valuable assets. 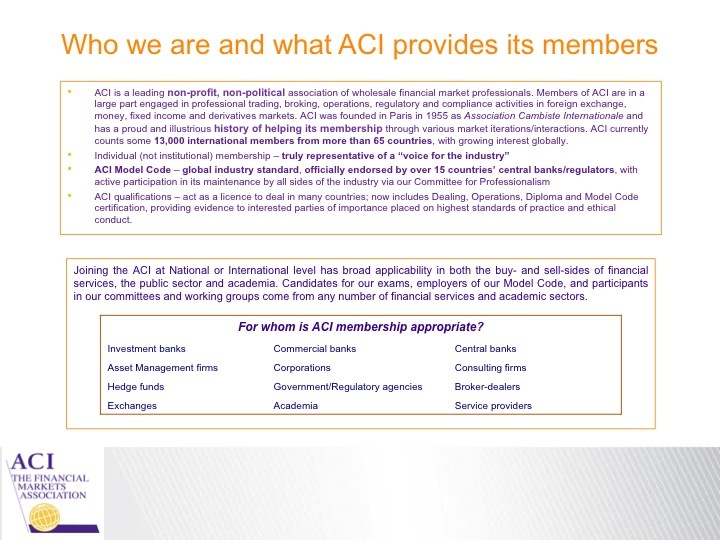 The ACI Model code, ACI globally acknowledged education syllabus, and the deep network of international members. Supporting these assets are our specialized committees, including the committee for Professionalism, Board of Education, and our ACIFX Committee. 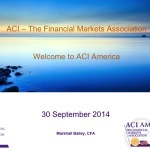 The goals for ACI America are to serve as a representative of all financial market professionals in our region. Our collective experience in every facet of the industry will deliver confidence to our membership that its interests are being represented within our marketplace. 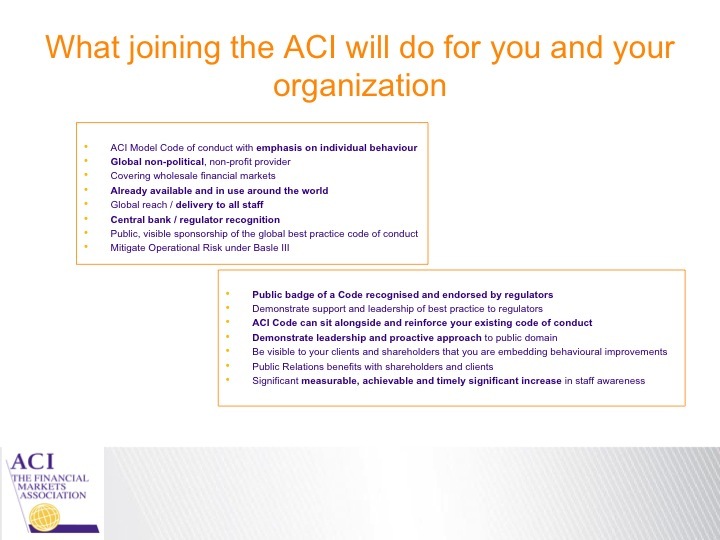 We will support with full vigor the ACI model code, a living document that was born decades ago and defines code of conduct, professional etiquette, and the proper rules of engagement for all practitioners. 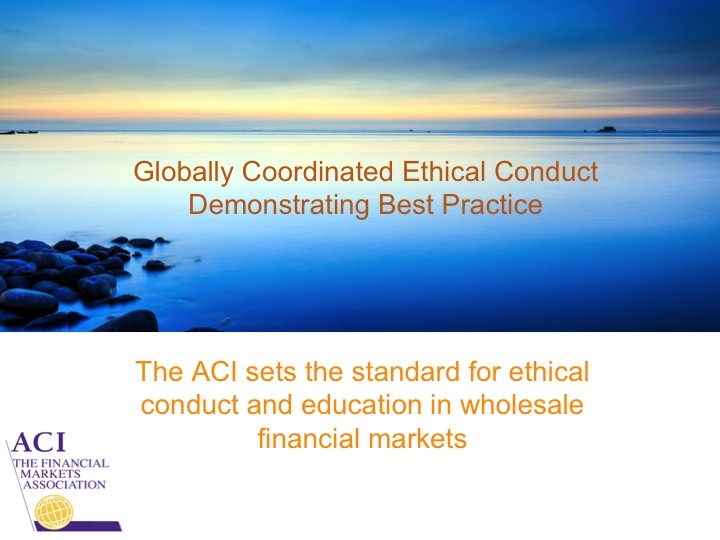 We will promote the ACI educational programs, which is created and managed by global educators who are deeply committed to enhancing market integrity. We will champion events, perhaps even similar to this one that support community and focus on issues and trends in the business. While technology and regulation continue to redefine strategic direction of each market participant, ACI America will endeavor to deliver communications that promote guidance, suggestion and oversight. And finally we will be charitable, and guarantee that our success is shared by organizations and individuals less fortunate and in need of our support. For the past 18 months the Foreign Exchange industry has been under severe criticism Negative press has blanketed the entire industry, provoking global investigations by central banks and regulatory agencies. 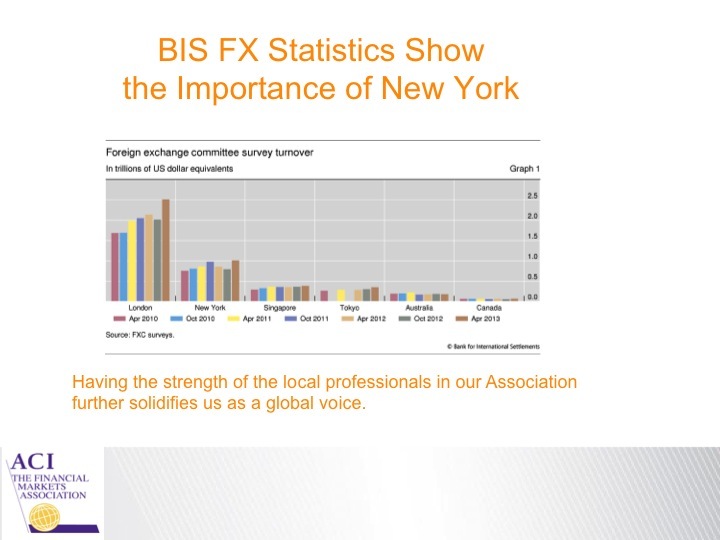 Through this difficult period, the collective voice of the foreign exchange industry was limited. Representation on a global basis should be strong and heard by everyone both in and outside the industry. 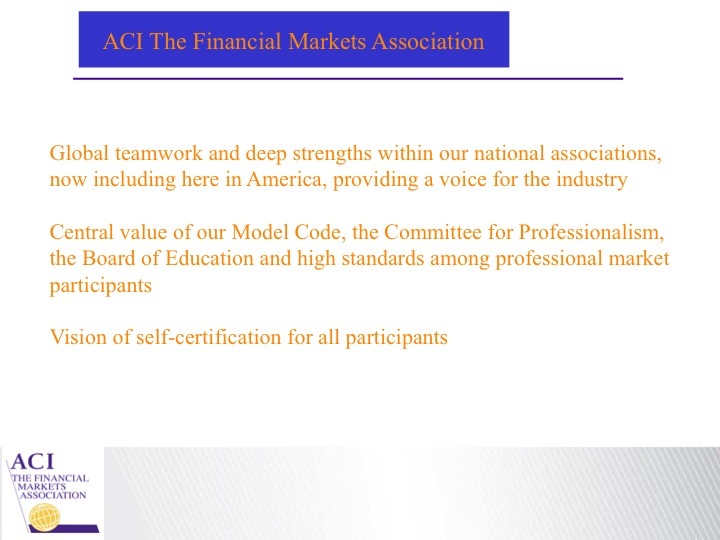 We believe ACI the financial markets association is the true identity of the Foreign Exchange markets, and our mission is to assist in strengthening its foundation and recognition that it rightly and justifiable deserves. Thank you all for your strong showing of support.